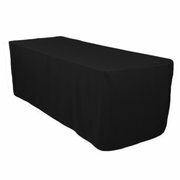 Have Tables to cover for your event? No need to worry about getting the right color for the color scheme of your event because black goes with EVERYTHING! A black table cloth adds a touch of elegance to any party!